As more than half of Canadians now carry around a smartphone in their pocket, many retailers have bemoaned the accompanying trend of “showrooming” – or checking out merchandise in a physical store, only to search for a better price on that product with a smartphone and then order it online. But according to a report from the Columbia Business School and loyalty vendor Aimia, it’s actually more complicated than that. There’s actually five different categories of shoppers that participate in showrooming, the report says. Each of them have a particular weakness that can be exploited to dissuade them from completing a purchase online and instead parting with their cash in a more traditional bricks and mortar retail store. Here’s the tactics gleaned from the survey conducted of more than 3,000 shoppers in Canada, the U.S., and the U.K. The full report is available for download from Aimia. Just click the image. Perhaps its not surprising that the operator of Canada’s Aeroplan rewards program, among other worldwide loyalty programs, is suggesting the use of loyalty programs to convince shoppers to buy stuff. But the report offers some surprising insights about mobile shopping behaviour, including the finding 74 per cent of mobile shoppers are older than 29. Also, 50 per cent of mobile shoppers actually said they were more likely to buy something in store after reading an online review on their smartphone. The Exploiters: It would be easy for retailers to write off the Exploiters as a lost cause. But the best opportunity for retailers to win their business may simply be to improve the store’s website. When Exploiters see a product on the shelf and pull out their mobile device, they are nearly as likely to search for it on the store’s own website as on a competitor’s site (69% vs. 77%). The Savvys: Although they currently represent only 13% of mobile-assisted shoppers, Savvys are the ripest target for retailers to try out new offers and experiences in the mobile space. They are simultaneously more digitally-savvy, more willing to sign up for loyalty programs, and more likely to be motivated by a range of retailer offers and rewards. The Price-Sensitives: Price-Sensitives use their devices in stores periodically, but not as consistently as the other segments. Often, the right in-store experience will be enough to earn the Price-Sensitives’ business. Their mobile devices may be with them, but still remain in their pockets and purses. 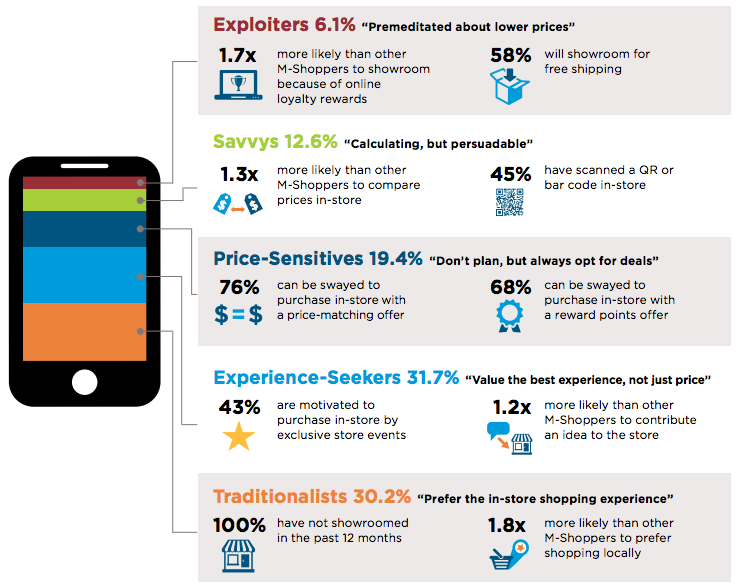 The Traditionalists: These shoppers are committed to purchasing in-store, making them the least threatening segment of mobile-assisted shoppers for retailers. They are open to interacting with retail stores on their mobile devices, whether by website, store app, or even scanning a QR code. But, they are currently using their devices mostly to consult on purchases with friends and family. The Experience-Seekers: As the largest of all the segments, Experience-Seekers point to the opportunity for retailers to engage customers on their mobile devices in non-financial ways, with opportunities to comment, provide ratings, etc. And they demonstrate why retailers still need to invest in providing a unique and compelling in-store experience.